Okay, so I didn't mean to rhyme the title, but once it was up I just decided to leave it. I have very few personal titles, but one that has held true through the years is "World's Worst Procrastinator". I am horrible about it. That's why my going to school online is like a circus at the end of the semester (rushing to cram everything in), and why Halloween costumes sometimes aren't finished until Halloween. 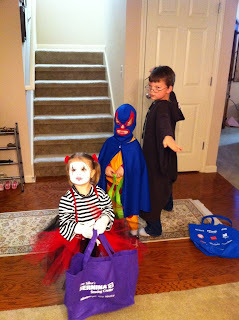 This year, Kai wanted to be a Mexican Wrestler after seeing the cover of "Nacho Libre". No problem.... done. Cam wanted to come up with his own Harry Potter costume... got it. 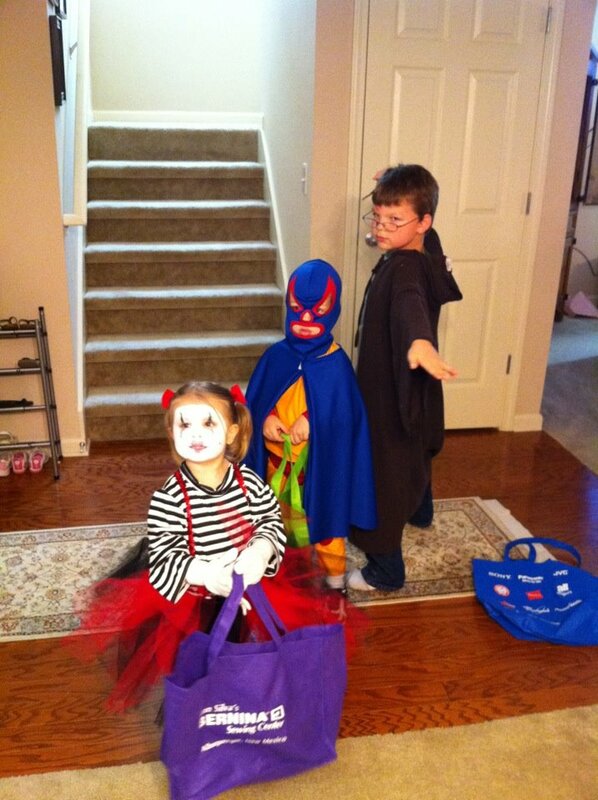 Scarlett, however, was going to be a mime. Do you know how hard it is to find a black and white striped shirt for a little girl? One that is plain without Minnie Mouse, some kind of heart, or cutesy saying? Impossible. Impossible unless you are willing to pay designer prices and special order something that you've never even seen. Call me thrifty, call me cheap, I just decided that rather than deal with that funk... I'd just make it myself. Ordered the knit striped fabric from Etsy, got some sparkly red sequined elastic trim from Joann's, and pulled out some tulle from my stash. I can't believe I didn't take more pictures, but I do have some videos (if I can figure out how to post one, I will). The shirt was completely my own pattern. I LOVE how it came out. I don't know how to describe it other than a semi-cowlneck/mock turtleneck. I plan on buying more knit fabric and recreating it for a tutorial. The tutu was made out of 3/4" elastic that was 1" shorter than her waist measurement and the ends sewn together. After that, I made the tutu the same way that I did on my "Ribbon Tutu-rial". (See Tutorial section above for link.) Alternated the colors for a cute stripe-like effect. The suspenders were the trim material that I talked about above. I got grumpy about not being able to locate clips that were affordable, until I came across some ironing board cover clips. PERFECT! I got a package of 6 for the same cost as a pack of 2 at Joann's. (Both are at Joann's.) Cut the elastic off the ironing board clips and sewed the elastic trim on. Used an "o" keyring at the "y" joint in the suspenders. Thank goodness that elastic suspenders are super forgiving. I only had to measure and sew once. Yay! The black leggings were purchased at Old Navy. And her gloves were a set of $1 cheap-o winter gloves. So funny trying to watch her put candy into her bag. Poor girl needed help every time. Oh, and the hairbows were made out of felt. I used this tutorial from "C.I.N.O." Thanks, Ashley! OMG, baby sumo!!! Sounds SUPER cute!